When my parents were visiting, we kept trying to play euchre — and Alrik just kept on winning. Look at those steely eyes concentrating on his hand. You'll also love this week's hilarious photos on the topic of Toddlers in Trouble over at Natural Parents Network! They'll make you feel better about whatever messes are being made around your house today. 14. Esthers First Day of School! That's a pretty intense stare! 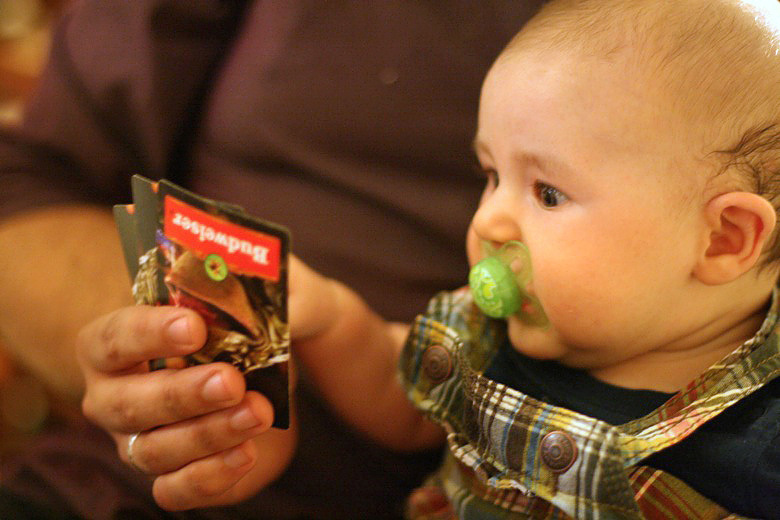 He seems impressed by that hand - maybe it isn't too early to start working on his poker face. LOL..the look on his face. so cute. You must have a great hand. Look at that expression on his face! Priceless. Perhaps he is willing the cards to change! Nice shot! That's concentration! He's growing so fast - wow! Thanks for the opportunity to link-up. It must be in the DNA. Watch out Vegas! Teehee. He looks shocked by that hand. It must have been a good one. That is awesome! I love the look on his face! I was too distracted by the awesomeness of his chubby cheeks to notice anything else about that picture! @Jenn Collins: Too true. I will start training him! @Dionna @ Code Name: Mama: They're our classiest cards for sure. The frogs make them timeless. @Amy @ Anktangle: We must! It was my dad who taught us, last summer when we were marooned in Cape Cod on our rainy beach vacation. He grew up playing it in Indiana. @melissa: Well, I can't argue with you there! Some say shocked, some say impressed, and I'd say concerned. It seems to me those wide-open eyes *are* his poker face. What could those big eyes mean? hilarious!! he looks so focused!